When picking your countertop material, you can’t go wrong with natural stone. Stone benchtops are the holy grail in kitchen design—it’s timeless, opulent, stylish, and durable. If properly maintained with regular sealing, this material can last a lifetime and will not show any sign of wearing out. It’s an investment… and homeowners are digging it! All varieties of natural stone can be used for kitchen benchtop applications. All you need to do is choose your stone and shade. This is the hardest part because you’re selecting from a wide range of options. You see, your needs in the kitchen must be the number one factor that affects your choice of material. Once you know your priorities, this task is a breeze. It can endure scratches and the high level of heat and moisture in the kitchen. Granite’s impressive strength comes from the slow cooling and crystallization of magma below the Earth’s surface. The process casts mineral atoms into a regular structure, making it the densest of all your natural stone selections. Granite is porous. 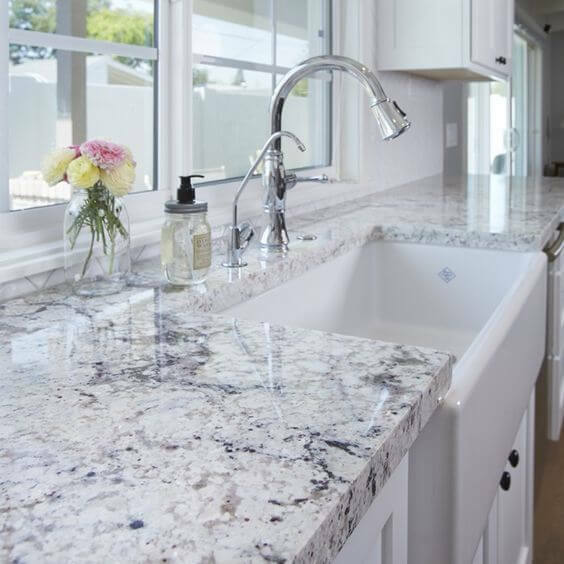 Most fabricators will apply a sealer to granite countertops before they install it in your kitchen. This is to protect the material from getting stained. Being porous is not a bad quality. It helps if your benchtop absorbs the water on its surface. You apply the sealant to maintain the aesthetics and to keep it from absorbing coloured liquids too quickly. Granite slabs come in varying looks, colours, and shades. Suppliers don’t always send free tile samples to their customers, but they let you see the material from a brochure or in person. Go for the design that best suits your kitchen style. Standard granite (and other stone) slabs come in 30 millimetres. If you prefer thicker slabs, prepare a bigger budget for transportation (it’s heavier). 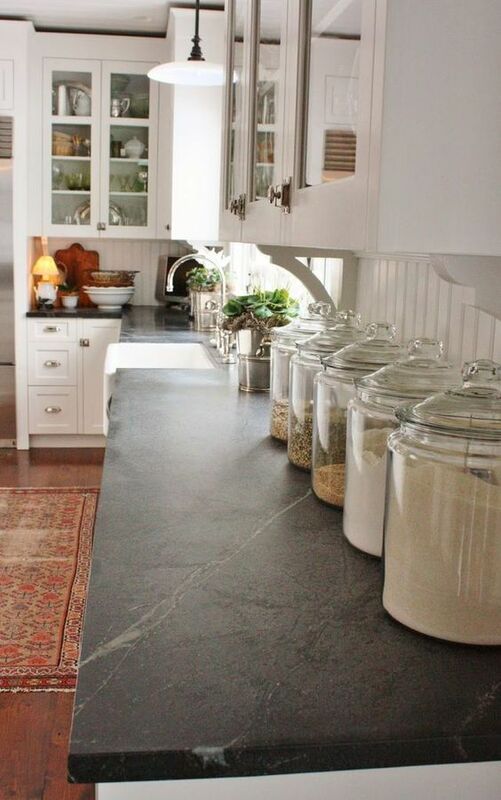 Consider customising your cabinetry too, because your cabinets should be able to carry the extra weight of the stone. Always smoothen the edges. Cut granite is sharp and dangerous! Remind the installers to leave it slightly bevelled or rounded. Go for slate benchtops. These come in stunning shades of grey and has fine and uniform grains in it. Being a popular roofing and paving material, we’re sure that slate can endure the high temperature and moisture in the kitchen. Slate is less porous than granite. Slate is brittle so it’s likely to chip when you accidentally hit it with something hard. Go for limestone benchtops. It’s soft to the eyes, warm to touch, and has some unique patterns in it. If you’re lucky, you might find a beautifully preserved fossil of shells and other aquatic life in your benchtop material. That’s a pretty cool conversation starter if you ask us! Limestone reacts heavily to acidic liquids such as vinegar and lemon juice. You need to wipe spills immediately and you need to use a cleaner intended for calcite-rich materials. This benchtop material needs regular sealing just like many stone tiles. Go for a travertine benchtop. This stone packs a lot of warmth and character in it! 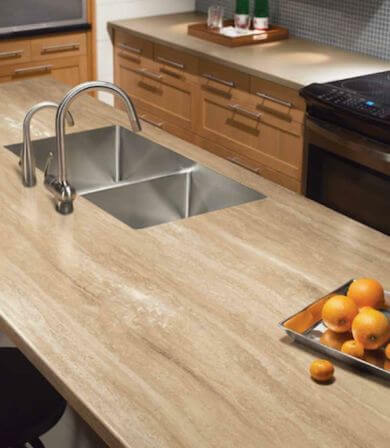 We’re confident that using travertine as benchtop material will result in a handsome feature in your kitchen. However, travertine is a type of limestone, so you need to seal and treat it like one. You need to fill the holes that run through the travertine tiles before sealing it. With appropriate treatment, this stone will outlast the toughest kitchen environments. Go for marble benchtops. Oh boy, it’s hard to resist the delicate and luxurious veins of this stone. Homeowners want it and are willing to spend more money on this surface — even if it’s hard to maintain. Similar to limestone and travertine, marble is porous and calcite-rich. It reacts badly with acid. You need to wipe spills immediately as it absorbs liquids quickly. You have to avoid rough movements, or else you’ll damage the surface. Marble benchtops are cool to touch. It’s the perfect worktop for bakers. 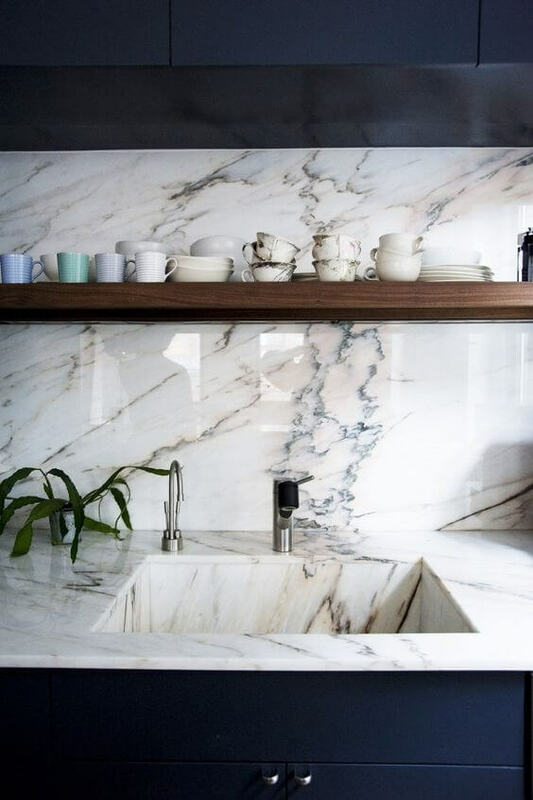 Can’t find or afford marble for your kitchen? Consider using dirty white or lighter shades of granite. Go for basalt countertops! This hardwearing material develops an interesting patina over time, giving your kitchen an aged look. Basalt is not a popular benchtop material yet. Like granite, this stone is tough, heavy and resistant to scratches. Basalt is dark grey in appearance and sometimes feature interesting flecks and veins in it. Basalt absorbs stains quickly despite careful sealing. These stains are responsible for the formation of patina. It’s either you love it or hate it. 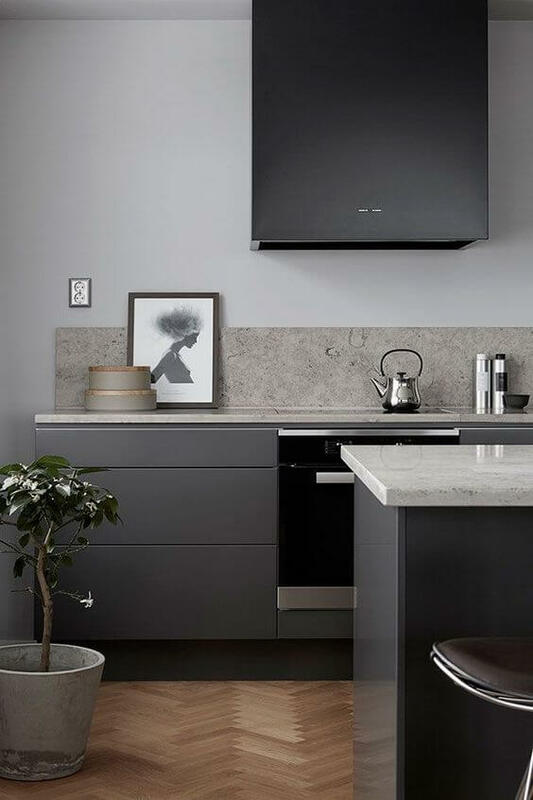 This grey stone is imported from the US and isn’t popular in Australia yet, but some benchtop suppliers in the country already offer it. It’s perfect for homeowners and designers who are looking for something new and unique. Soapstone is non-porous so it’s impervious to water. It doesn’t need sealing or treatment. All you need to do is oil the surface periodically to enhance the material’s beauty. It’s also heat and fire resistant. However, soapstone is easily etched. It’s made from a soft mineral called talc. It leaves a white and dusty mark when scratched. No worries, just rub the fleck with oil and it will return to its original grey colour. 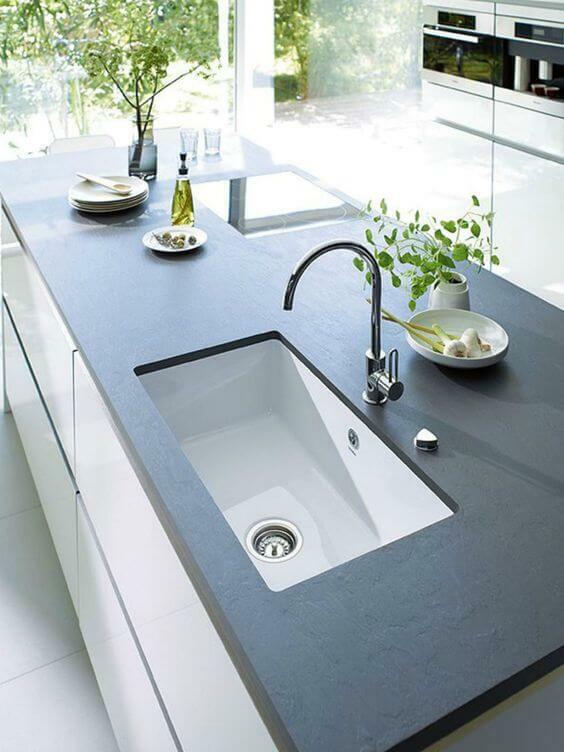 You can order a soapstone benchtop with an integrated sink on it. Ask your supplier about it. Sandstone is not as popular as granite and marble as kitchen benchtop, but it can do the job. It’s tougher than the three calcite-rich stones we featured earlier (limestone, travertine, and marble). This material is lighter and less expensive compared to granite. 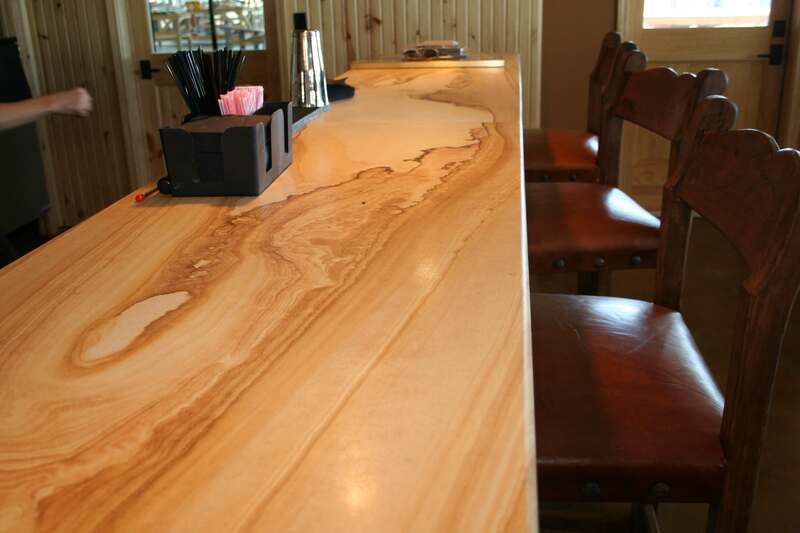 Compared to other stone benchtop materials, sandstone is easier to shape, cut, and carve. Another thing we love about sandstone is the material’s unique and stunning waves and grains. You still need to seal it to keep it from staining. Polish its surface and it will outlast a lifetime. Explore all possible countertop materials. You might find something that works better and costs less than the popular benchtop materials today. 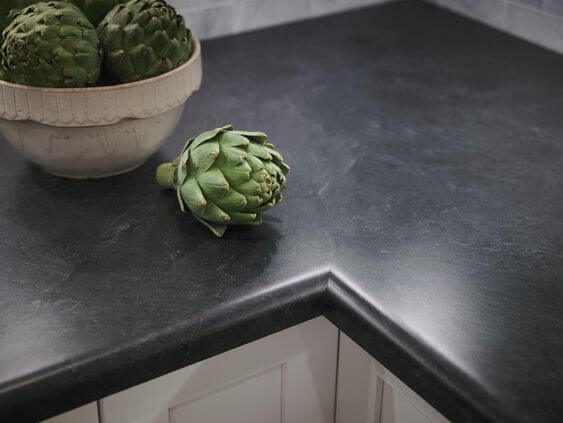 Onyx is a premium benchtop surface that’s made from dissolved limestone. 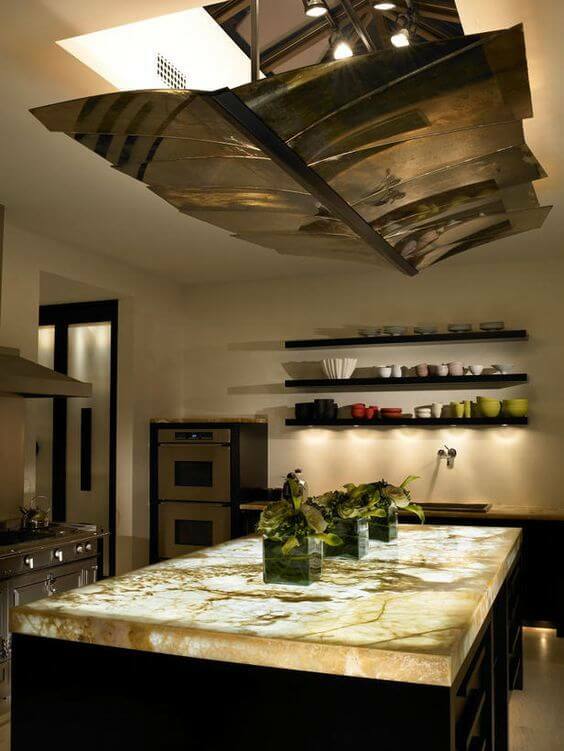 Apart from its lovely pastel swirls, this rare stone has a reflective surface which gives your kitchen an ethereal vibe. This is a porous material and you need to seal and take care of it similar to limestone. Lumix is a good alternative to Onyx. It looks like Onyx, but it’s non-porous and water resistant. Hire a kitchen expert to design your kitchen. Get architectural services in Perth.